I have tried integrate my form with vertical response and It doesn't work in a specific form. What should I do? I've tried integrating Vertical response to one of my test forms and was able to connect it normally without any issue. 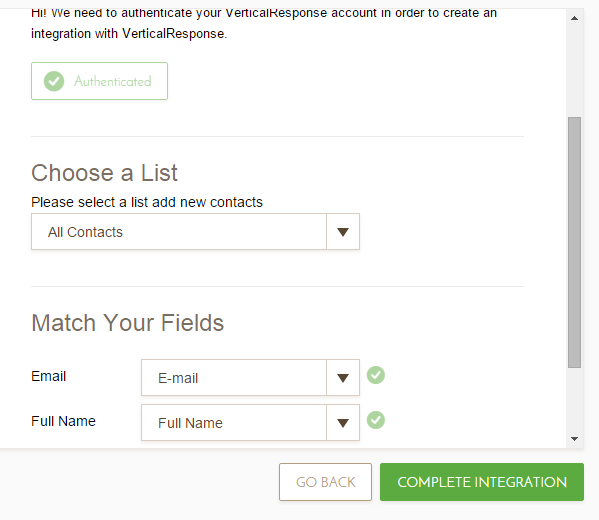 Do you see any error while integrating Vertical response with your JotForm? Please try logging out from active Vertical Response account on your browser and then remove the existing integration on your form to connect it again. It would be helpful if you can provide us with a screenshot of the issue so that we can guide you in the right direction. Please get back to us if you need any further assistance. We will be happy to help.